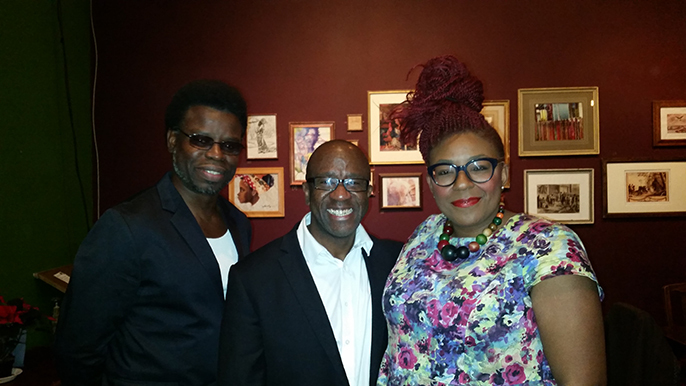 Tiata Fahodzi’s outgoing Artistic Director, Lucian Msamati, was honoured in a celebration held at the Tricycle Theatre on Tuesday 16 December. Tributes were led by the Chair of Tiata Fahodzi, Archie Graham who praised Lucian for a range of excellent work informed by his passion, integrity and special talent for collaboration and partnership. During his speech Lucian Msamati launched Tiata Fahodzi’s next production, which he will direct as the last creative project of his tenure. In collaboration with West Yorkshire Playhouse and Watford Palace Theatre, Tiata Fahodzi stages Zodwa Nyoni’s debut play, Boi Boi is Dead, a funny and moving story of a family torn apart by memories and music. Design is by Francisco Rodriguez-Weil, Music from Mike Henry, Lighting Design from Emma Chapman and the Sound Design is by Simon McCorry. The cast is Angela Wynter, Debbie Korley, Lynette Clarke, Andrew French, Joseph Adelakun and Jack Benjamin as the charismatic Afro-Jazz trumpeter Boi Boi. New Artistic Director Natalie Ibu looked forward to the forthcoming move to Watford Palace Theatre, which will see the company resident in a producing theatre for the first time in its history.